What Kind of Chocolate Should Be Used in a Chocolate Fountain? 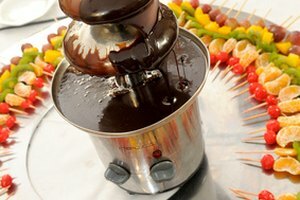 To provide the perfect ending for your perfect dinner party, a chocolate fondue or a chocolate fountain is both exciting and memorable. But there’s more to turning the chocolate into a liquid than just heat. 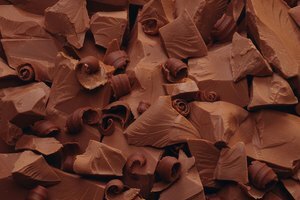 With a little dessert knowledge and a few tips, creating a cascading river of chocolate in which your guests can indulge is a snap. Pull out the fondue pot or chocolate fountain for a night of dipping and dripping sweet, runny chocolate. What Kind of Chocolate Should I Use in My Fountain? Wilton is one of the largest and most-trusted brand names for homemade baked goods' tools and ingredients, including melting chocolate. Wilton’s Chocolate Pro Melting Chocolate Wafers are high-quality chocolate made specifically to melt in a fountain or fondue. The smaller wafers allow the chocolate to heat evenly; it avoids scorching without the addition of oil or cream. The 2-pound bags make party planning easy, and you can store any leftovers in the resealable bags. ChocoMaker Fondue Dipping Candy comes in white, milk and dark chocolates, and each variety is made for use in a fondue pot or fountain without the need to add oil or cream. The small, thin wafers allow the chocolate to heat quickly, yet evenly. This brand features a smooth consistency with no graininess from the sugar, yet the chocolate is also thick enough to stick thoroughly to whatever it’s coating. If you choose to mix chocolate with oil or cream, use white, milk or dark chocolate morsels. The chocolate is more likely to scorch when mixing, so keep a close eye on the bowl and stir it often. The small pieces of chocolate heat more consistently. 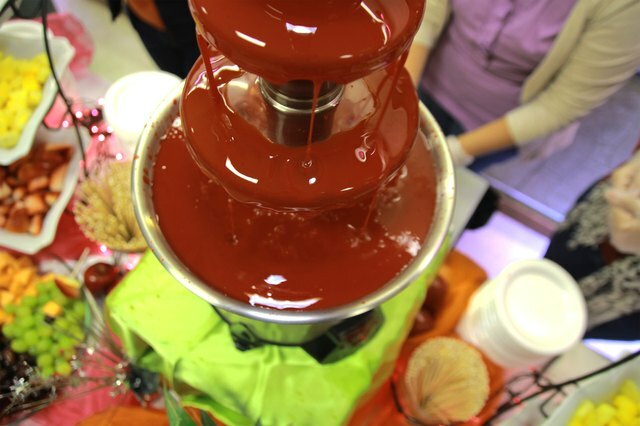 To prepare a chocolate fountain, many cooks add oil to thin the chocolate, which helps it flow through the fountain. 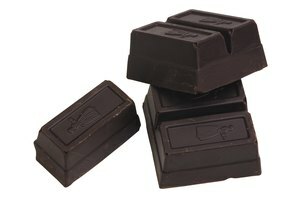 Unless you’re using a pre-mixed chocolate, use a ½ cup vegetable oil per pound of chocolate. Another option when mixing fondue or fountain chocolate at home is to use cream instead of oil. Again, use twice as much cream, half-and-half or non-fat evaporated milk, depending on the target taste and consistency. Dissolving chocolate in hot cream creates a ganache, but adding oil sometimes diminishes the flavor. A hard-working and palate-pleasing option, leftover ganache also works well for glazing cakes or to place in the center of a chocolate truffle. 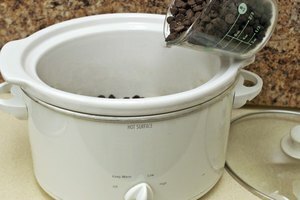 While almost everything pairs well with chocolate, consider a few important features of the melting process. Ingredients that are dipping wet can cause the chocolate to “seize,” or turn into a paste. Also, try to avoid overly crumbly baked goods and other similar dipping items ‒ the crumbs will contaminate the chocolate and create a grainy consistency. Try dipping sliced fruit such as strawberries, bananas, oranges, apples, pineapple, cherries, berries and pears into the flowing chocolate. Freeze fruit before dipping, so the chocolate will not only coat the fruit more quickly, but also prevent the fruit juices from dripping into the chocolate. Dried varieties of fruit also work well. Baked goods, ranging from cookies to cakes, are also good dipping items. Beyond the obvious, such as chocolate chip cookies, oatmeal-raisin cookies, cheesecake bites, brownie bites and pound cake, try more creative options. Meringues, fortune cookies, doughnuts, popcorn, potato chips, waffles and ice cream sandwiches are all unusual option that will surprise and delight your guests. Consider allergies when choosing ingredients. Sensitivity to nut allergies and gluten are important when serving a large group of people. Label ingredients if they might have been exposed to nuts, and include a note as to their gluten contents if it’s not obvious.